Or had confirmed, or moved my thinking on….it’s been a big year. Last July, I came across the Pearson “5 Things I’ve Learned” series via Ewan Mcintosh’s contribution. The idea of identifying five big ideas that I have come to know, or to have learned, appealed to me. I did have great intentions to follow up this tweet with an actual post, but that never happened. It did for Donna Fry though, and as always, Donna’s post is deeply reflective, refreshingly honest, and eminently relatable. It has sat at the edge of my mind, nudging me to get on with my own “5 Things I’ve Learned” post, until now. Since the ending of a year causes us to reflect on the past twelve months, and the beginning of the new year pushes us to consider what the new year holds for us, I decided to use the “5 Things I’ve Learned” format as the tool to do all of this thinking. Of course, this means I am tweaking the format so that the “5 things I’ve Learned” is reflective of the thinking and learning from this past year specifically, albeit they are built on the ideas that have permeated my life generally. I am listing the five ideas, but no hierarchy is intended. I am an interdisciplinary or connective thinker, so all of these ideas lead from and to each other depending on the conversation or problem. 1. Work harder to build trust. Understanding that relationships matter is not new. Neither is it a new idea that trust is a foundation block in relationships. What I learned this year is that to build real trust (read here trust that doesn’t let you down, that enables you to grow and change, that supports you, that is loyal) you have to work really hard. But the work, whether it is face-to-face or online, is not quick conversation over coffee or in a Tweet chat. It is not having the same view on pedagogy or technology integration. It is not about being on the same team, in the same department, or in the same course. It’s not only about making others feel good about themselves and their daily work. Rather, the hard work of building trust is that work that is inconvenient, goes against the grain, needs lots of time, pushes us out of our comfort zone, is transparent, and forces us to keep our promises and tell the truth. 2. Passion and Commitment. This has been a curious year for me professionally. I began it as a K12 literacy coach, and I will finish the year as a high school English and Student Success teacher. Regardless of our role, I was, and am, reminded each day that we need to bring our passion for learning and our commitment to our students to the fore. More than that though is the realization that passion and commitment are fed through the collaboration and co-learning work teachers engage in. As a coach, I was privileged to spend time in many classrooms. Have a peek at what passion and commitment looked like: I saw teachers as storytellers, explorers, researchers, readers, writers, and problem solvers. I saw teachers as learners who did their homework and modeled innovation and change. I saw teachers who worked hard everyday to love what they do and then instill that love in their students. These teachers are my inspiration now that I have return to the classroom. And the experience of collaborating and co-learning with them pushes me to generate that work in my school. When teachers work with teachers, we create a culture that encourages the conversation and leadership required to ensure success for all students. 3. Students Reflect Back What They Observe. I believe that students mirror back to us our behaviour, our language, our habits, our values. We can run climate surveys to discover what courses students might like to take, if they feel safe in the school, or what extra-curricular activities they would like offered. We can ask why they are late for class or if they have space and opportunity at home to complete homework. We can ask them for their feedback on how the school can be a better place for them. Or we can think about our students’ behaviours, both social and academic, as feedback to us based on us. 4. To Initiate Somewhere in 2013, I ran into Seth Godin in a serious way. I am sure that I knew about him, heard him interviewed on various shows on CBC Radio, and possibly even purchased a book of his for someone I love. But Mr. Godin had not permeated my consciousness until this past year. I like lots of his thinking; I think it can be applied to so much of what we do in our private lives as well as in education, but the idea that really resonated with me this summer is the idea of initiating. I needed to hear this message. I had been enjoying learning about social media platforms and I was having a very nice time engaging in various online professional learning events, but I realized that my attention was beginning to wane. I had been doing a lot of learning and now I needed to use it. I would, of course, apply my new learning in my teaching, but I had just come from coaching for the past three years and my love for developing and delivering professional learning was (is) strong. Just do it, right? Get started. Don’t wait for others to initiate. Be fearless. 5. Be Ready to Make the Shift. This past year I participated in my first mooc–Educational Technology and Media Open Online Course or ETMOOC. This event profoundly changed the way I think about learning in an academic setting. Sure, ETMOOC was an open, online course, but I didn’t know what that meant. I just knew I was taking a course. I knew there would be webinars and Tweet chats and that I needed to blog about my learning. That was all okay with me. I knew about webinars from work and my Masters’ program and Tweet chats from some online communities I had joined and I had started a blog for #cyberpd2012. What was going on here anyway? Where was the stuffiness? The stiffness that comes when a group of strangers ends up in some room together for a mutual, yet individual experience? There’s music playing at the outset of the first “lecture”. The “prof” is super casual, chatting away with folks, and the chat box is flying with comments. There is a familiarity in the room; a feeling that we all belong. There are no titles used or groups constructed by what level you teach….no map. There is Dave Cormier heckling Alec Couros (an inside job, but I didn’t know that, yet). There’s the whiteboard interaction that clearly gets out of hand. This opening learning event set the stage for a learning experience that was challenging, engaging, supportive, integrated, free-flowing, always on, permissive, immediate, organic, and …fun! Did I learn anything? Beyond learning about digital literacy, digital citizenship, content curation, digital storytelling, open education, and beyond developing increased comfort with social media platforms and tools, and beyond creating digital products like Storify, 5 Card Flickr, LipDub, and writing blog posts, ETMOOC taught me about the changing educational landscape. The ground is shifting beneath our feet, and we must begin now to shift with it. 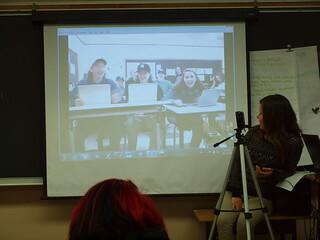 Mystery Skype: There’s no mystery here. But, today I want to focus on what happens when we understand the power of technology integrated into our teaching and our students’ learning. We have been using some technology in our class this semester. A wiki that houses lessons, video, and other resources, Google docs, and recently Twitter and Edublogs . Much of this tech integration is straight-up substitution, and although students are enjoying tweeting out learning goals and daily takeaways, and having access to the Internet in the classroom via Chromebooks, the interaction still falls into the ‘fun and games’ category. I cringe every time I am asked if my students are more engaged because of the technology in my room. In reality, it has taken us months to feel comfortable using Chromebooks, to understand Google Drive, and to incorporate any of the tech and tools into our day. We have not yet had enough experience using the Internet and its products as learning resources. Social media platforms continue to be used strictly for personal use, so bringing them into the learning environment did cause some surprise. And what they did not impact at all was our intellectual engagement with the course big ideas, questions, and materials. There have been no sparks, no meaningful connections, no newly discovered rabbit holes. When Sarah Le tweeted me about the possibility of running a Mystery Skype with our two English classes with the ultimate goal of having a conversation about First Nations stereotypes, my antennae began to crackle. Here was an opportunity to test the power of flattening the walls, engaging authentically, and creating conversation for learning. And yet, what underpins all of this is our ability to think…to plan, to predict, to design, to gather appropriate resources, to problem solve, to collaborate, to take risks. This event, then, was not about technology, at least not wholly. We had plenty of time to get ready for the big day. We had assigned roles, prepped questions, vetted the other class’ questions, gathered some resources, and held a dry run of the event. The Internet was a bid dodgy, but otherwise, the students felt they were ready. We weren’t. 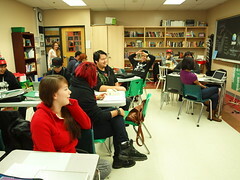 The second the call ended, students began to evaluate their performance. In under an hour, students recognized and articulated their learning needs; the same learning needs that I have spent the last two months teaching to. The difference? I think their expressions say it all. Open Online Learning 2013 presents an opportunity to re-think how educators and learners go about assessment. What is evidence of learning? Who decides? We can, of course, co-create the success criteria, but as we move to more self-directed learning the success criteria will need to be individualized too. As we move toward student inquiry, what students present as evidence of their learning will vary; and as students push their learning to where they need to go, their products will uniquely represent that learning. When we step outside the box, there are so many possibilities. When we begin to understand what it is we need to learn and what we care about learning, then, how we might go about that learning will not only surprise us, but will challenge our notions of what evidence of learning looks like. About a year ago, I ran into the idea of badges as ways to symbolize learning. Of course, I thought it was hokey. Badges are good for Scouting and Guiding, not real learning. Now don’t jump all over me…I realize my thinking here was flawed, but that is the way many people view badges. You get them for swimming levels and skating levels; you certainly don’t get them for academics. By participating in experiences like OOE13, educators have the opportunity to experience learning in ways that are completely new to them. As I learn online via my PLN, moocs, blog reading, and/or participation in Twitter chats, Connected Educator Month events, or a whole host of other venues, I might want to acknowledge that learning in some way. And that’s what badges do. The process allows me to select the evidence that I believe is relevant, meaningful, and valid to me, to cite that evidence, and then to be acknowledged. I am so proud of the badges I have earned to date. They inspire me to reach for more. Isn’t this the role of assessment?